Kolkata Knight Riders are back home at Eden Gardens, but they need a change of fortunes. In the space of four days, the two teams are facing each other for the second time. 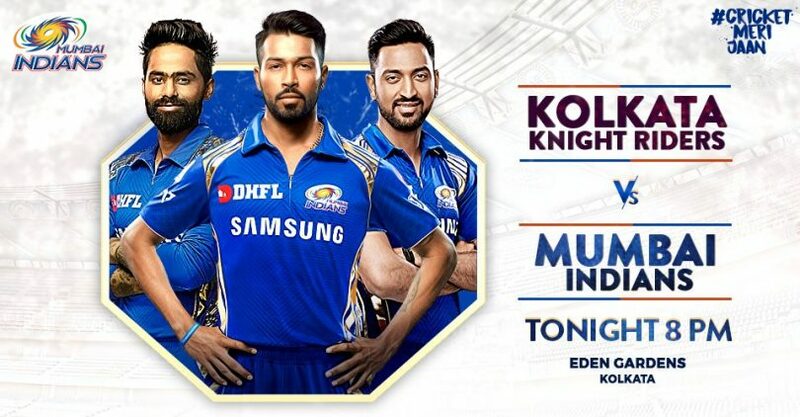 Kolkata Knight Riders lost to Mumbai Indians in their previous game and now face a big task of keeping themselves in the top four in the points table. Mumbai Indians have suddenly risen in the tables with consecutive wins. They defeated KKR in their previous game and before that, they won against Kings XI. In a typical MI type campaign, they began on a horrific note, losing four consecutive matches but are back in playoff contention with four wins out of 10 games. If they win the remaining four, they will qualify for the playoffs. The Kolkata Knight Riders’ record against Mumbai is extremely bad. Mumbai has defeated Kolkata in 17 out of 21 matches. This is the best performance against any particular opponent of an IPL team. The win is a must for both teams for the run-up race. In such a situation, this fight has become even stronger. Mumbai’s Hardik Pandya has taken 14 wickets in nine games. He will be the challenge for KKR in bowling and batting. Fast bowler Ben Cutting was quite expensive, in the last match, Robin Uthappa had scored four consecutive fours. His replacement Mustafizur Rahim of Bangladesh may be a better option. KKR has won five matches, which is a win more than Mumbai. Another defeat will be a big setback for both of them.